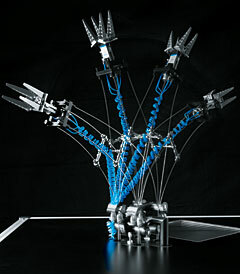 Festo has been working intensively on the topic of bionics since the early 90s. In 2006, the Bionic Learning Network was launched – an association of renowned universities, institutes and development companies. 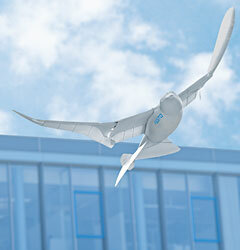 Since this time, Festo has been developing and supporting projects and test objects whose basic technical principles are derived from a wide variety of principles found in nature. Cont'd from part one and part two. A freely movable handling system . The Bionic Handling Assistant comprises three basic elements for spatial movement, along with a hand axis and a gripper with adaptive fingers. This horizontal tripod is rotated at 90 degrees from the conventional configuration and can be displaced by up to 90 degrees in any direction within a large working space. The bionic principle of the fish's tail fin is used here in several ways as a three-dimensionally adapted FinRay® structure in energy-efficient lightweight design. The gridshell is regarded as one of the most efficient load bearing structures. The latticework of linear, rod-like elements can span large areas with a minimum of material. PlusMinus combines efficiency and aesthetics. The latticework is formed by inflated film tubes which are flexibly connected with each other via the joints. By inflating the tubes, the structure erects itself – thereby doing away with the need for time-intensive auxiliary constructions. The Robotino® XT combines the mobile Robotino® learning system with a portable version of the Bionic Handling Assistant. Just like its successor, the Robotino® XXT, it acts as a research platform for developing new methods and tools for service robots and the production assistants of the future. With the Bionic Tripod, Festo is adopting a new approach in handling technology as an alternative to the portal systems that are predominant in mechanical engineering. Unlike these designs, with Bionic Tripod 3.0 the drive unit and the handling system are entirely independent of each other. This technology provides diagnostic and analytical methods in which certain characteristics, components or parameters of moving fluids such as density, volume, colour, or the content of harmful substances are detected and evaluated. Optofluidics The fluid is charged with information that can be subsequently read by optical components. It thus becomes a medium that carries in itself the code for optical analysis. Devices such as cameras and sensors visualise the diagnosis in real time, without the process flow having to be interrupted.